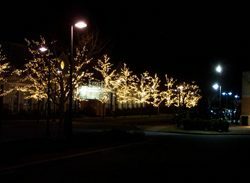 Evergreen Environments is Connecticut’s most experienced holiday lighting company. 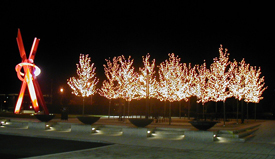 We have been doing light displays for commercial properties and residences for over 25 years. From single trees and large dramatic displays to simple building outlining and displays that play to musical themes, we’ve can do it all with excellence. 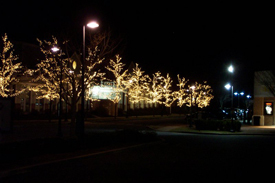 Now is the time to implement your plans for holiday lighting. Dollar for dollar, you get the most effect by using holiday lighting. 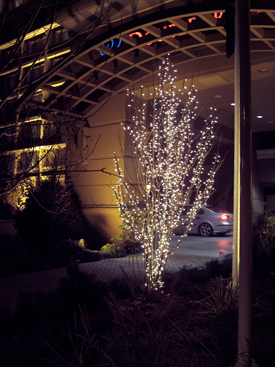 At Evergreen Environments, holiday lighting is our specialty. 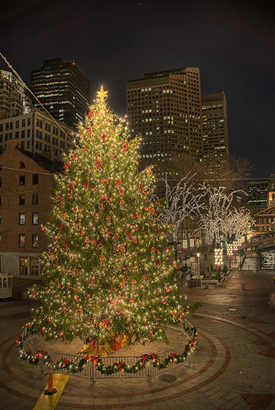 We have installed lights on numerous landmark buildings throughout the northeast. 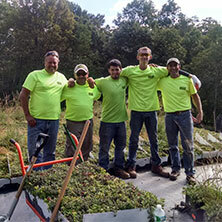 Evergreen has the ability and knowledge to do this type of work safely and properly. 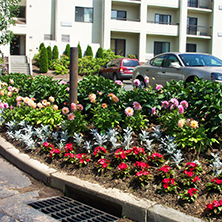 We take into account the difficulty of the job, the available electrical sources, and the surrounding environment (including people and traffic). 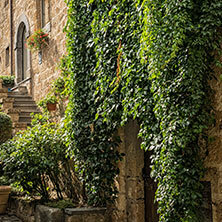 When it comes to lighting, small mistakes can become glaring black holes or bright spots. 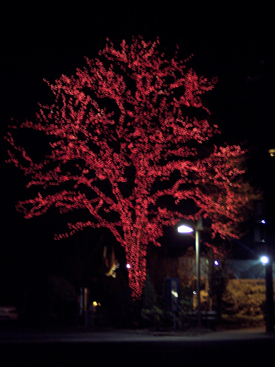 Should something not look right when your tree is lighted, we will dive back in and correct the problem. We take pride in our work. 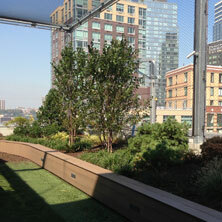 Our crew gets much enjoyment out of the finished product, and we make the effort to do a good job in the first place. LED lighting has become all the rage these days. LEDs have several advantages over incandescent lights. Most LED’s are rated for 60,000 hours of usage, enough to last many years. This is a stark contrast to popular white mini lights, which only last about 3,000 hours. One of the greatest benefits of LEDs is that they use 92 percent less electricity than regular lights. This results in great savings, especially when you consider the durability of these lights. The only drawback of LED lighting is that it is more expensive up front. However, if you factor in the savings on electricity and the longer lifespan of the lights, LEDs make the most economic sense. 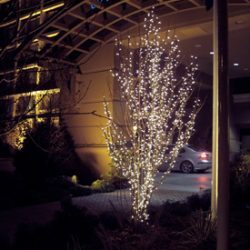 Can you leave the lights on the trees year round? Are the lights protected from passersby and traffic? 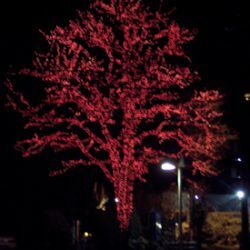 If you would like assistance in deciding between LEDs and incandescents, don’t be afraid to contact Evergreen Environments. 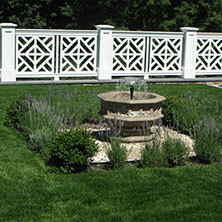 We would be happy to sit down and discuss which option will work best for your vision and budget. 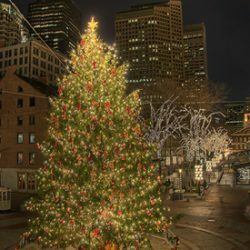 How many lights can you use? This is often the deciding factor in a holiday lighting project. Lights need power. For white incandescent bulbs, you can generally install 55-60 sets per 20 amp circuit (assuming the circuit is dedicated to the lights only). 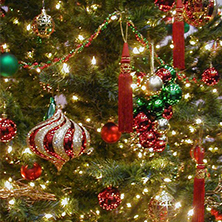 For larger bulbs, you are limited to a couple hundred bulbs per 20 amp circuit. Of course, with LED lights and their lower power requirements, those limits go out the window. You can get most jobs done with a circuit or two.